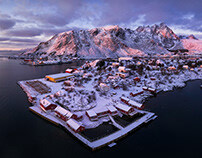 The Lofoten islands in northern Norway have sure had a big influence on me as a human and especially as a photographer. Back then, around ten years ago during my first trips, i just went there for hiking and to be out in the majestic nature. But soon i started having the urge to portray these beautyful landscapes and few years later i started calling myself a landscape photographer (whatever that really means). 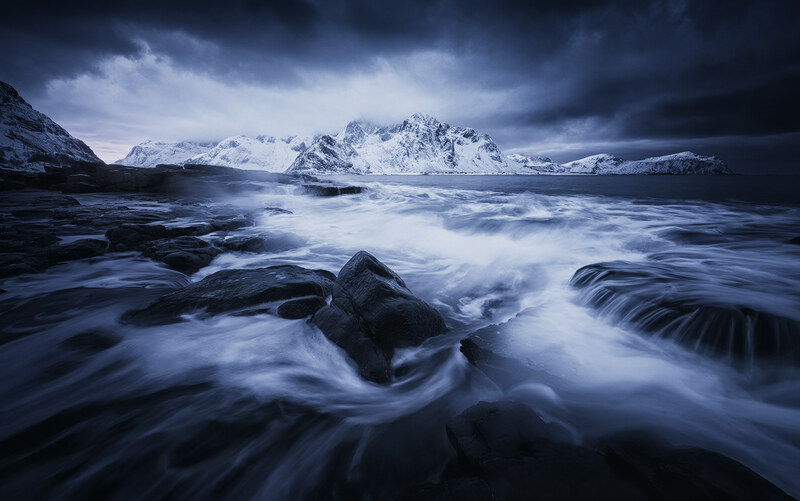 When a place is as picturesque as any of the different fjords and mountaineous islands that make the Lofoten archipelago (the name of the islands means "feet of a lynx" originally because of the shape of the archipelago), things become almost too easy as a photographer. 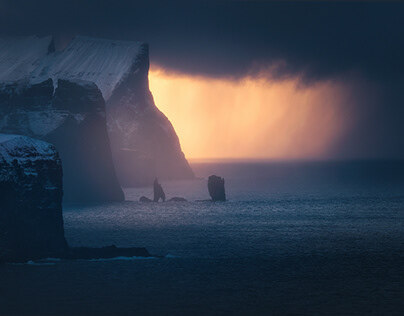 It´s almost as if nature created these places in the most photogenic way potentially possible. This also brings a challenge in these times where millions of great photographers often have the same destinations for their trips. The amount of beautyful imagery is huge nowadays, and places that had once been secret tips are now called "classics" on a daily basis when you look at Instagram and other popular sources for landscape photography. So nowadays i can´t be fulfilled with taking a replaceable image of one of these iconic locations anymore- instead i chase these short moments of light that make a scene look different than it looks most of the time. Most often i hunt previsualized images that have grown in my head where i need different factors to align properly to be abled to "harvest" them. But sometimes i also just simply react to what mother nature has on the menu on the given day at the given place. Here´s a collection of my favourite images taken during the last years. 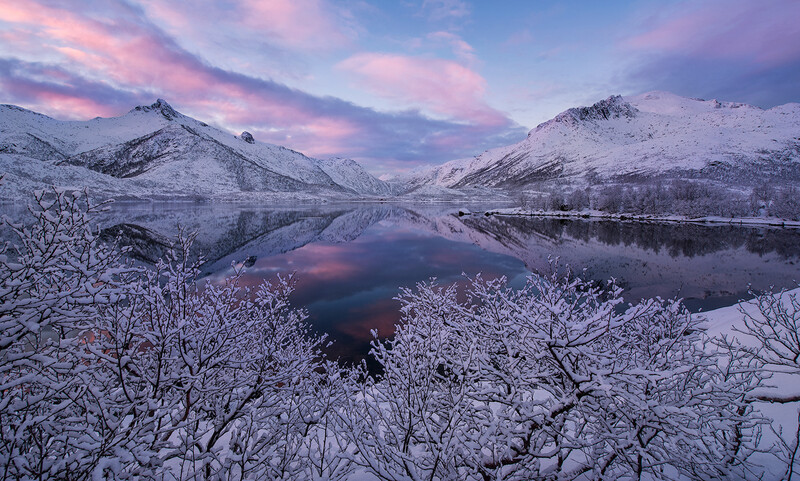 Let me take you with me on a little journey to northern Norway, far above the polar circle, where the contrasts of weather, light and landscape are incredible and the local inhabitants are wonderful open minded and hearted people. While one can always be lucky and have everything ligning up as planned on the day where you head out for photography, most often it takes a while to have the conditions i needed for this image. As i live in Germany and only visit Lofoten for some weeks/months every year, it took me quite a while. To get the background nicely lid up, the moon had to be strong. In order to capture the structures of Skagsanden beach, the tide had to be right and last not least i needed the aurora to be visible and the weather cooperating with clear skies. After seeing this image on the display of my camera, i had a huge smile on my face! It had been a trip of mixed feeling in winter 2015. I was on the islands for roughly a month and for most of the time i had rainy weather. This can be quite demotivating when you have the plan to shoot great winter scenarios, as rain means that the ice and snow will be gone (only remaining on the highest peaks). As there will be absolutely no colour in the few trees or the shrubs, it will look like you came to late for autumn. Still beautyful of course, but not what get´s me excited. But during one of my last 4 days, the weather changed. It got stormy and cold. I could smell it before going to bed and excitement grew by the hour. I shot this image during a stormy sunrise after some snowfall at night and chose to go for a rather monochromatic look in processing to show the menacing, grim mood of the day. For me it was a change for good tho! Another image i had been "designing" in my head for quite some time, until the situation allowed me to "collect" it. High tide, big waves and a great sunrise- all these things tend to lign up in those moments where you don´t expect it. But when you have a fix idea and only limited time to realize it, of course most of the time it won´t happen. But then, one day in january 2015 it finally happened. 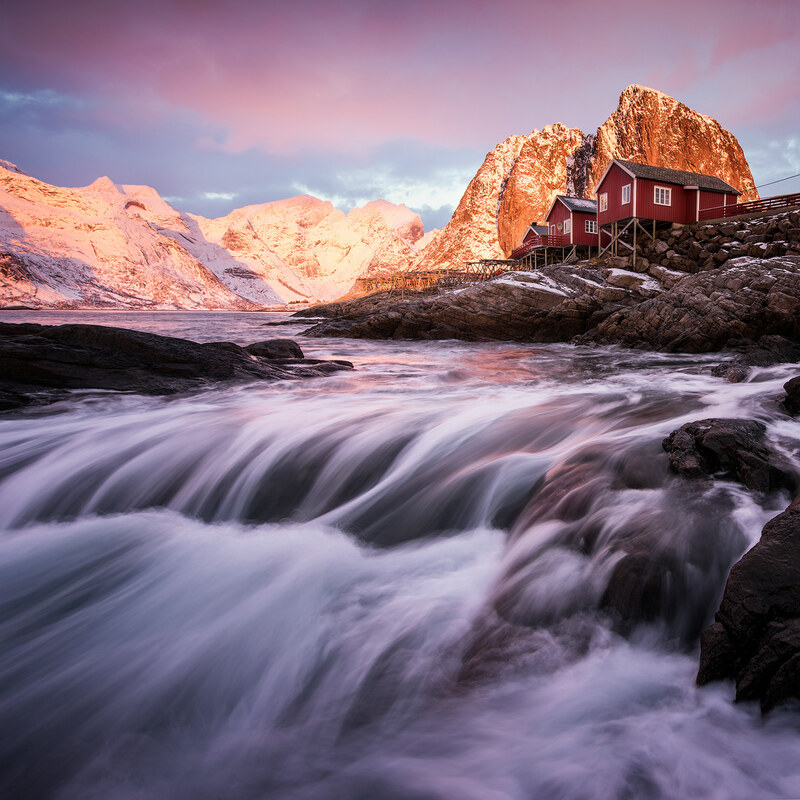 To show a different view of the famous cabins of Hamnoy, i chose to go to the rocks on the shore under the bridge. I actually got trapped on the rocks because i didn´t watch my surroundings, completely immersed in "the zone". A fellow photographer directed me the way out yelling towards me from the bridge above this and i made it out safely but totally drenched. Unforgettable moments! 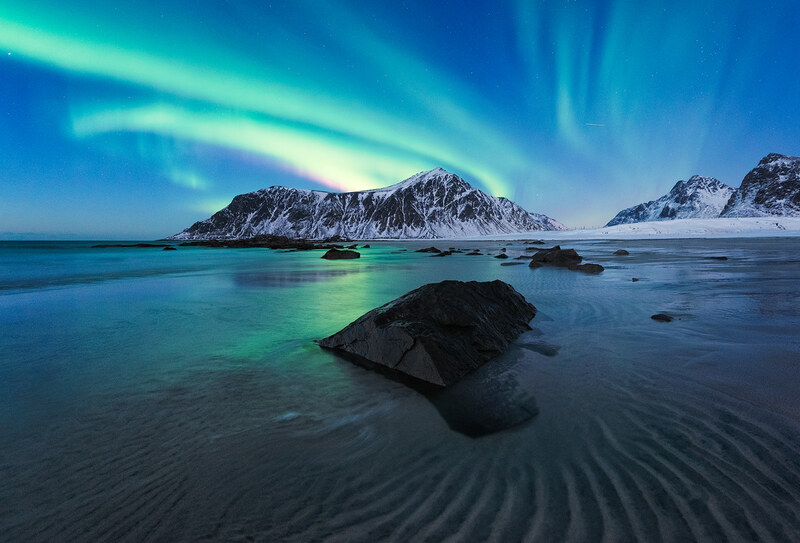 During a very dark night around new moon, the northern lights grew strong at Skagsanden beach during low tide. This allowed me to capture the Aurora borealis reflected as ripples in the receding waves. While i like this image and had it awarded as travel image of the year at National Geographics, i since then wish to capture it again with more moonlight to have more details in the background and shoot it with lower ISO settings. 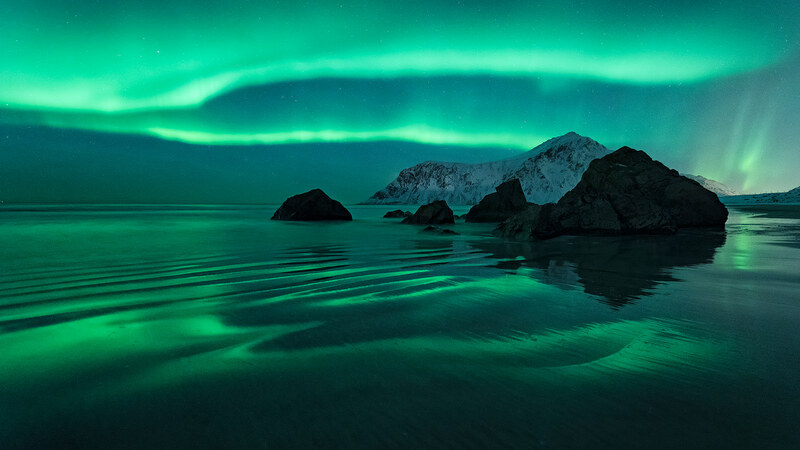 But it will be forever one of my best memories of Aurora photography, because i was completely alone on Skagsanden beach that night for hours. Nowadays the location has become so popular that most likely one will share it with around 30 other Aurora addicts- which is still cool, but the solitude out there was always priceless back then. Another image from that winter trip where i had "bad" conditions for most of the trip with the islands laying there as a boggy brown autumnlike mess. 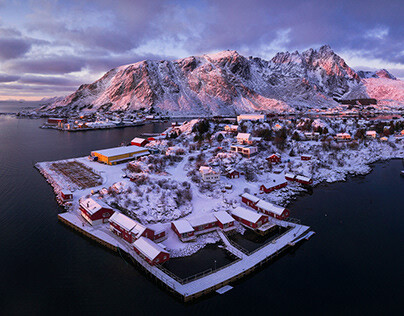 It took only one night of snowstorms to convert the islands into a gorgeous winter wonderland. These views are what makes me shiver, when the pristine views are almost too much to handle for me. A hike that normally is a piece of cake took me a long time without snow shoes, but in the end it was more than worth it. Another image taken the same days as the monochrome one in this series only like 2 hours later. In january the days are very short, so one has to evaluate if a change of location makes sense. But the good thing about it: You can shoot an everlasting sunrise that fades into an everlasting sunset. Finding the ice covered rocks at this rather unspectacular creek gave me a good compositional anker point so i got down low in the water and chose this central composition. The title might seem strange, but after posting this image on Instagram i got a message by a local that told me that his grandfather had gone to school in this building many, many years ago. 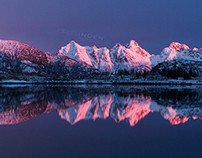 It´s a classic drive by shooting image- i was roaming around the islands with my two little sons in the car- they luckily fell asleep when i suddenly saw the light painting the mountains and reflecting in the windows of the old school. Needless to say that i was very happy to be abled to shoot an image as i had originally planned to make it a no photo day and it was my wifes turn for photography. On Lofoten one can also shoot interesting motives standing right next to the car. I made an extra tasty dinner that evening! After a longer hike through deep snow, a fantastic lighshow unfolded. 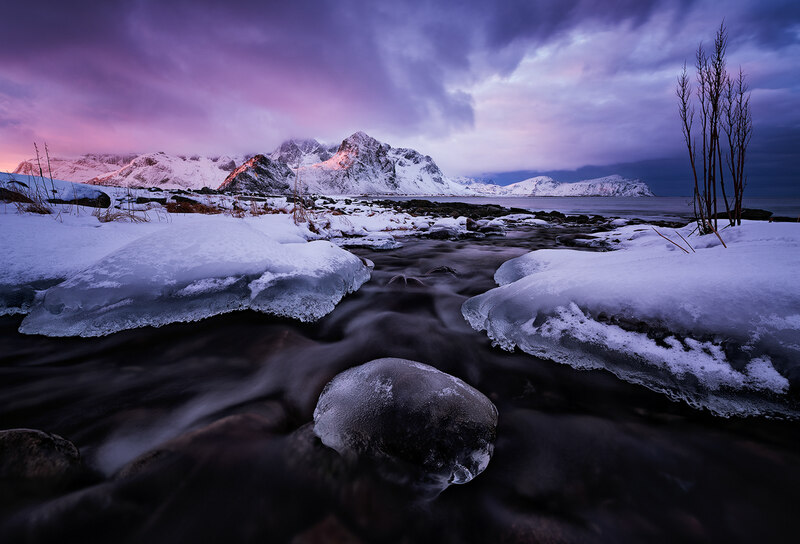 As the night had been very cold, the fjord was covered with ice that was breaking open as the tide rose again. 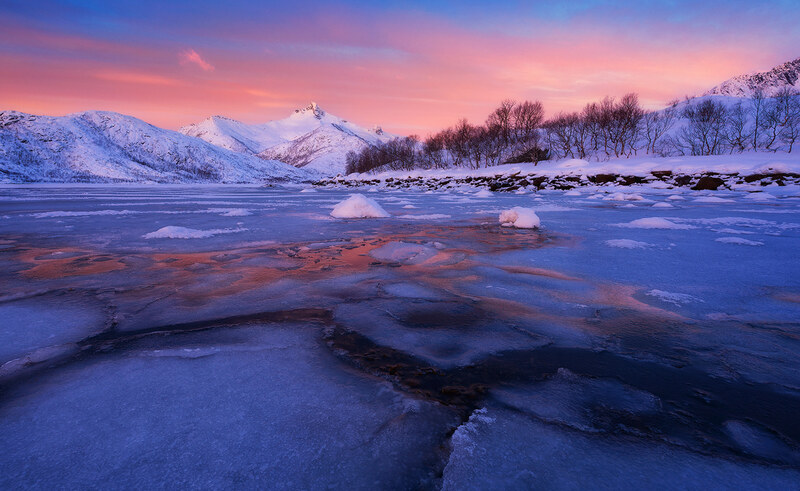 Standing there completely alone, consumed by the view, only listening to the crackling sounds of the ice... priceless! Sunset had been a cloudy dissappointment and the Aurora forecast was low. I was almost ready to call it a day and take cover in my cozy sleeping bag in the tent. But i wasn´t abled to give up hopes for an interesting image, so i waited for an hour or so. Suddenly the cloud layers started dissipating and the light pollution of the biggest town of Lofoten started throwing an interesting glow into the lower clouds. 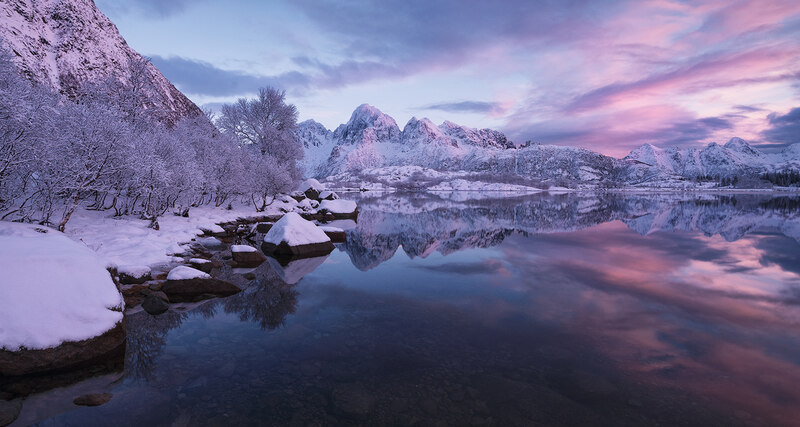 This was even reflected in the freezing fjord. Needless to say i stayed there happily until i felt like an ice chunk. Slept for 4 hours and then even the northern lights popped up, but that´s another story. The most spectacular light i have ever seen up there seen from one of my happy places. The lightshow unfolded for over an hour, this was around the climax of it. For some minuntes the everblowing arctic wind died down and allowed these majestic reflections to appear. I was a happy fella jumping around in the snow on my hike back to the car. 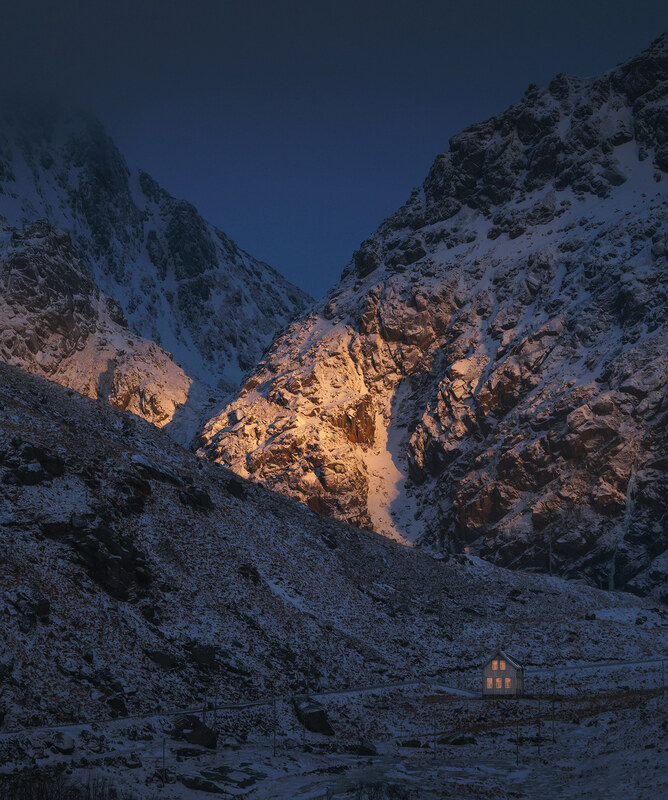 This image was taken a little before this view towards the cabins of Hamnoy went totally nuts in social media. I had never seen a twilight capture of it, so i settled out to capture it, For once i had the right conditions on my first try- a gorgeous blue hour twilight fading into the night contrasted by the warmer lights of the street and the cabins. Later on, even the northern lights popped up. What a night! Besides beeing obviously fascinated by the landscape itself, i also have a big passion for the villages or better the people living out there in such remote places. This is the first image i have ever taken of the northern lights (in 2013) and its also one of the few images i still like from those times. It got awarded at the Global Arctic Awards a year later. The northern lights were not strong at all- in this low activity range most often they appear as a slowly moving green band that can be at one place for quite a while. This allowed me to capture this stitched panoramic image of the cozy cabins under the arc of Aurora. After this image i stupidly coughed on my lens which then froze over completely in seconds. The show was over anyways so i made my way to the cabin and tried to sleep (almost impossible after the energy boost that i get from the northern lights). 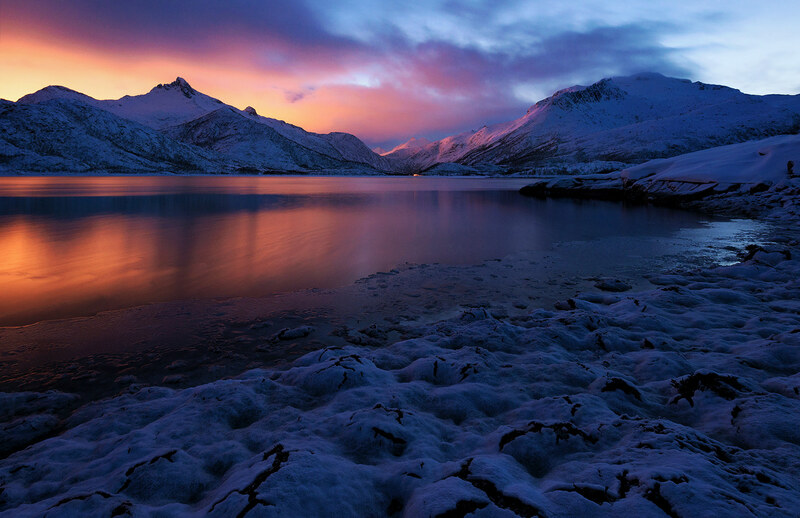 Haukland is one of the most famous beaches of the archipelago for a good reason. This makes it a challenge to capture it in a clean way as most of the time a stampede of photographers leaves an absolute mess in the foreground. Not this day though- i chose to capture the famous bending creek that flows into the sea during the moment where the next snowstorm was coming towards me. This weather is special, all sounds get muted and the atmosphere is very dreamy when you stand there. Hence the rather minimalistic processing that i chose in the end.